On one side of the cross is an illustration of the Crucifixion. On the cross arms are the hour lines and the symbols of the zodiacal signs indicating the declination of the sun, along with arabesque decoration. At the bottom is the date '1588'. 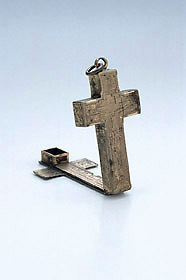 The other, outer side of the cross has an engraved coat of arms and the motto 'Nil admirari' ('nothing is to be desired'), with an equal scale marked  to 25 by 1, numbered by 5, indicated 'Partes umbrae' and an unequal scale marked  to 70 by 2, numbered by 10, indicated 'Gradus altitudinis'. The inner part of this side of the cross has an unequal scale of latitudes marked  to  by 1, numbered by 10, indicated 'Gradus latitudinis loci' and on the short arms of the cross the latitudes of six places. On the other part of the cross is a plate with the latitudes of six places and the signature 'A. Zeelsti faciebat Louanij', and a brass index arm for adjusting the latitude.